Version 1.1 was found to suffer from a spectacular crash when iPad is held in landscape orientation, due to blue dinosaurs breaking space-time continuum to co-exists with fuzzy giraffes. An update to address this problem has been submitted to Apple and is pending for release soon. If you have already updated to version 1.1, please run this app in portrait mode only until further updates. Giraffes will thank you for that. What is Sleepy's Coloring Book? 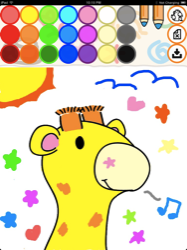 Sleepy's Coloring Book is a finger painting app for the iPad, featuring 3 characters – Gerara, Funky Giraffe, and Sleepy Dinosaur! 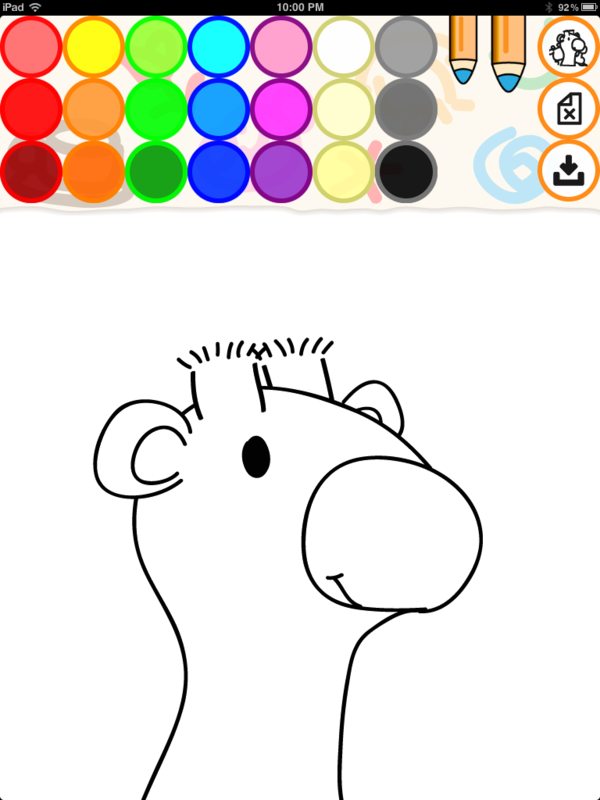 Sleepy's Coloring Book is compatible with iPad and iPad 2 running iOS 5. 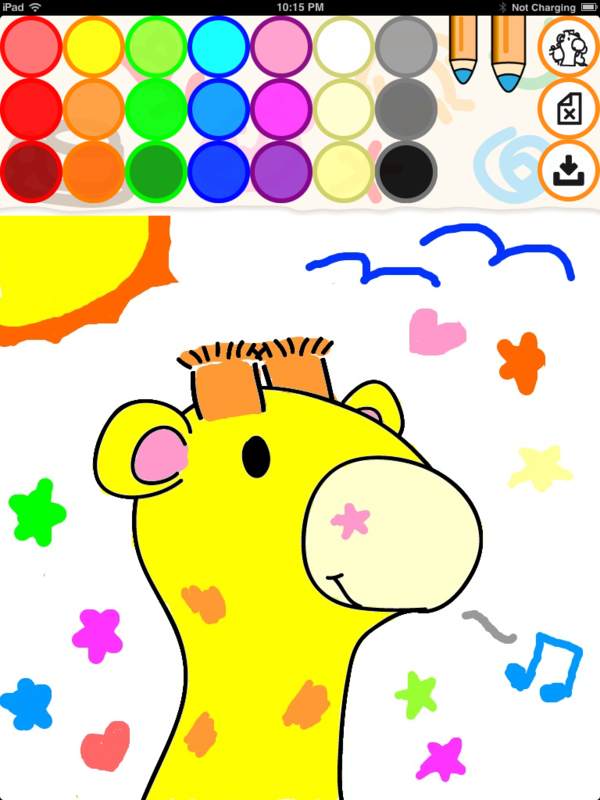 Gerara is a giraffe girl who aims to be a superstar. In her spare time, she likes to try out poses in mirrors and hog the camera. Apparently, she now hogs the app icon too. Can I save my drawings? Yes, simply tap on the save button in the palette panel. 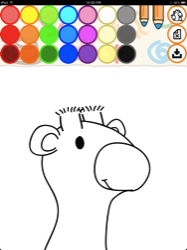 You can find your drawing by pressing the home button and launching the Photo app. Look for your drawings in Camera Roll (or Saved Photos for the original iPad). Is this available on the iPhone? Yes! 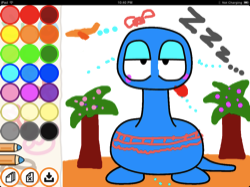 Sleepy's Coloring Book Mini is now available for iPhone 3GS or later / iPod touch 3rd generation or later. It is designed specifically for the smaller screen. Check it out! This app does not collect your personal information in any way. Keep in mind that your iPad may still send diagnostic information to Apple if your iOS is so configured. To view this system setting, open Settings app and go to General -> About -> Diagnostics & Usage. Gerara™, Rafy™, Funky Giraffe™, and Sleepy Dinosaur™ are trademarks owned by Danny Y Huang. Use of this App does not grant you the right or license to these trademarks. Apple®, iPad®, iPhone®, iTunes®, and App Store℠ are servicemarks, trademarks, or registered trademarks of Apple Inc.